Steven Spielberg’s latest installment, Jurassic World, is getting mixed reviews. It is rated PG-13 due to intense sequences of science-fiction violence. It is part action and adventure; part mystery and suspense; part science fiction and part fantasy. It came out for a wider audience on June 12, 2015 for US movie enthusiasts. 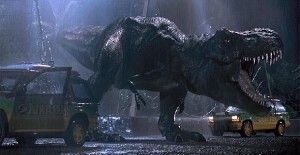 Colin Trevorrow directed the movie while characters were created by Michael Crichton. Amanda Silver and Rick Jaffa wrote the story for it. The two hour three minute movie is distributed by Universal Pictures. The plot unravels at the same island as Jurassic Park. Claire is sent to the island with Zach and Gray to have fun. Claire is not the mothering type and soon they face a park that is experiencing technical difficulties that turn to a contained anomaly. Some say Jurassic World contains more violence and terrifying than the original movie, Jurassic Park. Sustained terror and suspense is more intense and peril due to people have been eaten, torn apart, severely injured and trampled. Some even say the language due to use of certain words is questionable. Heavy use of product placement is also critiqued by some. Even though it is rated PG-13, it may suits more teens than a younger audience.